…as the traditional ties that bind fell away, the human impulse toward community led people to turn even more to the government itself, allowing statism—even totalitarianism—to flourish. From the time that classical liberalism reached its zenith until totalitarianism achieved the same was a matter of a few short decades – from utmost respect for the individual to utmost devastation for all individuals. What happened? 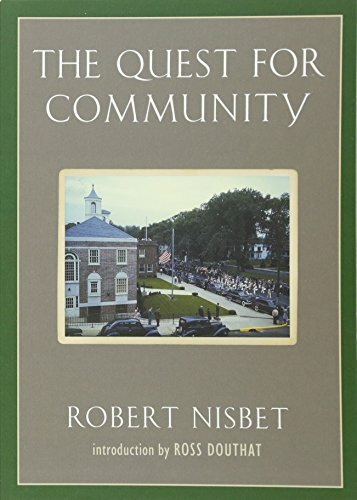 Robert Nisbet examines this question, and I will examine Nisbet. I will begin with the Introduction to this current edition, offered by Ross Douthat. Recognizing, by the end of World War Two, that history could no longer be described as a long, unstoppable march from dark to light, conservative thinkers began to explore…what happened? It seemed contradictory that the heroic age of nineteenth-century laissez faire, to which free men, free minds, and free markets were supposedly liberated from the chains imposed by throne and alter, had given way so easily to the tyrannies of Mussolini, Hitler, Stalin and Mao. Man is a social being, and his desire for community will not be denied. The liberated individual is just as likely to be the alienated individual, the paranoid individual, the lonely and desperately-seeking-community individual. No longer finding community on a personal level, he finds community in the totalizing state. Thus liberalism can beget totalitarianism. …it’s possible for both liberal government and liberal economics to flourish without descending into tyranny, so long as they allow, encourage, and depend on more natural forms of community, rather than trying to tear them up root and branch. In my very early, dogmatic, years, I struggled with Gary North’s assertion that people will always ask “who’s in charge around here?” I do not struggle with this anymore. I have come to learn that there will always be somebody or something in charge – all that is left for those who desire liberty is to consider well our most libertarian master. I have offered culture and tradition – and the culture and tradition to be found in the best of Western Civilization seems to have best fit the bill in history. Otherwise not choosing (or pretending that humans do not have a desire for community) is also a choice – and the fruits of not choosing are to be found in our current condition.